BEIJING, April 5 (Xinhua) — “The air and environment in the cemetery have been notably improved, with less people burning joss paper,” said Wang Fang, a tomb sweeper from Yinchuan, Ningxia Hui Autonomous Region. This year’s Tomb Sweeping Day, which falls on Friday, witnesses more changes, as China has made various efforts to reform funeral traditions in recent years, and ecological burial and environmentally friendly tomb sweeping practices are increasingly popular. In a tea garden in Hangzhou in east China’s Zhejiang Province, there stands a hidden cemetery where burial plots are built under tea trees in a bid to enlarge its green area as well as conserve land. “It would be good to return to nature here after I pass away,” said a local resident surnamed Wu. China has seen progress in ecological burials in recent years, especially in developed cities. The first model ecological cemetery of Beijing has been built in Babaoshan Revolutionary Cemetery, with a green coverage rate of nearly 90 percent. Currently, ecological burials in first-tier cities, including Beijing, Shanghai and Guangzhou, takes up more than 20 percent of the total. It is expected that by 2020, the share of ecological burial across the country reach over 50 percent. In addition, tomb sweeping practices have become greener. Most tomb sweepers would rather present flowers at tombstones than burn joss paper to pay tribute to their deceased families and friends. On Tomb Sweeping Day, some cemeteries hold cultural activities, such as calligraphy and painting exhibitions as well as poetry recitals as an alternative to tomb sweeping. Besides the “tea garden burial,” other ecological burial methods in China include tree, flower, wall and sea burials. Replacing traditional tombstones with trees and flower beds, putting urns on shelves in walls or just dropping ashes into the sea requires less or even no land. “At first people said it was for those in financial difficulties to save money, but as time changes, the popularity of ecological burials have increased,” said Zhao Quansheng, manager of a Yinchuan-based cemetery. “A customer told us that his father voluntarily asked for an ecological burial to conserve land,” Zhao said. Non-profit cemeteries are also thriving in places of separate burial traditions. In Yishui County, east China’s Shandong Province, 110 non-profit cemeteries have been built, leading to conservation of large areas of land that otherwise would be utilized for burial sites. Xue Feng, Party secretary of Yishui, said it used to take about 20 to 27 hectares of land to accommodate all the private tombs in the county, but now it only needs 10 percent of that. China has beefed up funeral infrastructure and public services, with the number of funeral parlours and cemeteries reaching 1,760 and 1,420, respectively. Since 2009, the Ministry of Civil Affairs has pushed forward fee reduction in basic public funeral services as well as other preferential policies, benefiting low-income groups. For example, commercial cemeteries in Chongqing, Gansu and Ningxia were required to set aside part of their burial sites as non-profits for those with financial difficulties. “Now the whole funeral is free, including the urn and burial site, which is a great help for households with low incomes like us,” said Yuan Li, a rural resident from Yishui, where funeral services have been free of charge since 2017. Xue said the fee-reduction policy could save the public nearly 200 million yuan (about 30 million U.S. dollars) annually. The Ministry of Civil Affairs issued a pilot plan for funeral reform in 2017, and released guidelines with another 14 authorities on further reform in 2018. A woman from southeastern China has returned 300,000 yuan (US$44,710) to 300 people – many of them strangers – who donated money to a crowdfunding appeal she started four years ago. In 2015, Hai Lin posted an appeal for 300 donations of 1,000 yuan on WeChat, with a promise to pay lenders back within five years. She kept her promise – and paid back all her loans two years early. The internet was abuzz with the story of Hai’s crowdfunder, which was reported by Pearvideo.com on Tuesday. Many people said it warmed their hearts and restored their confidence in society. Hai took to the social media app WeChat in June 2015 to say that she needed such a big sum as her father – a lorry driver – knocked a man down and was to pay compensation. Shortly before that, Hai’s mother was admitted to hospital with bleeding on the brain. Hai said the accident was a big blow and, for the first time in her life, she felt frightened. In her post on WeChat, she wrote that she was looking for 300 people to lend her 1,000 yuan each. She planned to pay back those debts in five years by returning money to five lenders each month. To her surprise, 300 WeChat contacts, many of whom were not acquaintances, came up with the funds in one night. In July 2015, Hai began to pay back the money she had borrowed. By July of last year, two years ahead of schedule and thanks to pay rises and year-end bonuses, the debt was cleared. Some creditors had deleted Hai’s WeChat details, so she had to track them down. “Girl, thank you for restoring trust which I thought I’d lost and for warm feelings that will stay with me,” one of her creditors wrote on WeChat. Another said that when he received Hai’s money transfer he thought someone was joking. After recalling Hai’s appeal, he said he was touched by her gesture. “You gave us 300 people a warm hug,” he said on WeChat. Twitter-like, while users added 10,000 combined reposts and comments. “It shows this woman is a nice person in her everyday life and deserves credits. I would lend money to people like her,” another wrote. 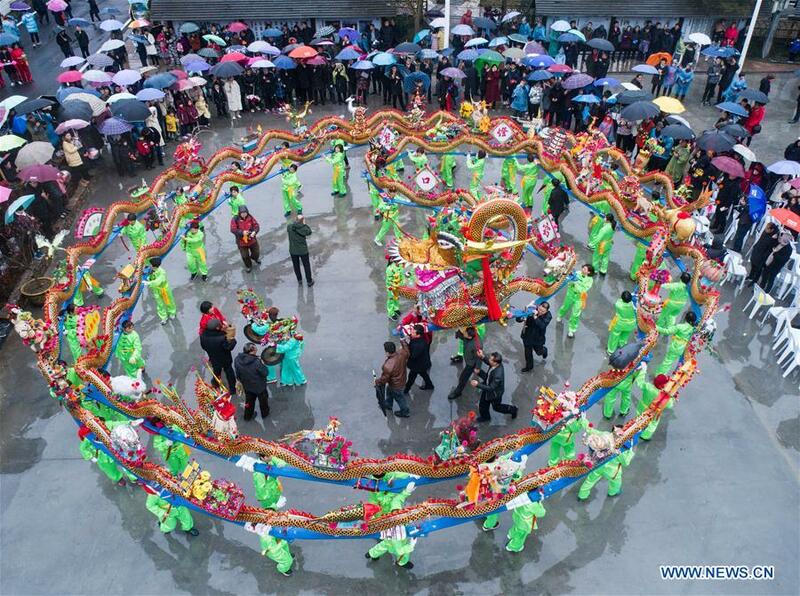 Aerial photo shows members of a rural female dancing team performing wooden-bench dragon dance to celebrate the upcoming Chinese Lantern Festival, which falls on Feb. 19 this year, at Yaokou Village of Huyuan Township in Hangzhou, capital city of east China’s Zhejiang Province, on Feb. 17, 2019.